It should be no surprise that the most common days of the week that we’re a kids’ birthday party place are Saturday and Sunday. Nearly everyone wants to have their child’s party on a weekend, and we’re more than happy to accommodate. But the rest of the week (including Saturday morning), Hot Ground Gym is all about Junior Boots, our proprietary kids fitness program. We’re dedicated to helping kids get the exercise that they don’t get during a normal week at school or after school, and letting them have a great time while they do! Junior Boots includes activities for kids in grades Kindergarten through 8th grade. Of course, kids of that age are of all different sizes, and putting a first grader with someone entering high school next year isn’t always going to give the best results. That’s why Junior Boots is broken down into Alpha Company (Grades Kindergarten through 2nd Grade), Bravo Company (3rd Grade through 5th Grade), and Charlie Company (6th Grade through 8th Grade). There’s also Junior Boots Basics, a slightly shorter class for beginners. While you’re at it, check out the schedule here. 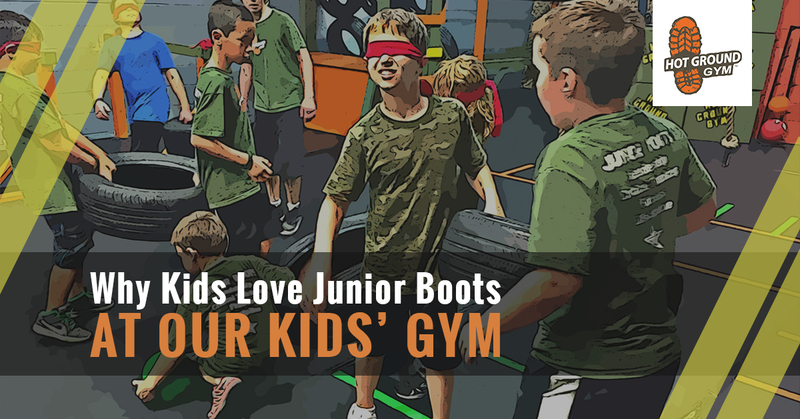 So, what’s so great about Junior Boots at our kids’ gym? Glad you asked. Here are the main advantages of our gym for kids that goes well beyond a kids’ fitness program. There’s certainly something to be said for “going it alone” in some situations, but the founders of Hot Ground Gym are ex-military. They know very well that anyone who tries to go it alone on a mission isn’t coming back. Everyone in Junior Boots will be given the opportunity to be a leader at some point or another. Not only is it good for the more shy kids who wouldn’t often get the chance to do so, but it’s also good for those who might otherwise always be leaders to get a chance to listen to the opinions of others. Everyone will be a follower at some time in their lives, so it’s important that they learn how to take instructions as well as give them. Our indoor obstacle is changeable, meaning that we can move it so that different challenges are created as needed according to the goal of the day. Kids will have to adapt to this changing landscape as the come week after week. They’ll need to work together (there’s that teamwork again), and they’ll also have to think through the course and find out the best way to traverse the problem. Sometimes it’s a flash of genius from one child, other times it’s working together to analyze the problem and talk through it as a group. Our Junior Boots kids fitness program is highly structured. This isn’t just so that we can lord over the kids so that they’ll stay in line. It’s because teaching kids to focus on the activity at hand can help train them to solve other problems in their lives. If they can come together and work as a team, focusing on the problem at hand, that’s going to help them whether they end up being a coder, a musician, or a construction worker. It’s a lifelong skill worth learning! Why did we save this one until last? It’s certainly not the least important. It’s simply because, when you’re looking for kids’ activities in the Vernon Hills area, this is the first thing most parents think of when the see our website. While the kids’ fitness part is critical to so many aspects in their lives, it’s also the most obvious one. So let’s go ahead and talk about it. Physical fitness is important to kids’ physical and mental health. We’ve talked about this before and discussed why it’s getting harder and harder for kids to get the activity they need in their lives. We’re here to ensure that they get the exercise they need throughout the week, instilling in them a desire to find something fun that also keep them in shape. It’s something we hope they’ll keep with them for their entire lives! Here at Hot Ground Gym Vernon Hills, we don’t take our responsibilities lightly. We know how important kids’ fitness programs are, and how such programs can help them socially and intellectually as well. Take a look at our schedule to find out how our Junior Boots program can enrich your child’s life!